Cleanliness is an important factor when you are milking a goat or cow. It’s important to keep the milk clean. Bits of hay, dirt, or whatever else your dairy animal decides to lie down in doesn’t need to end up in your milk bucket. Ick! Keeping the pen clean helps, but rain and mud happens. To ensure clean milk (and delicious), the dairy animal’s udder and teats need to be thoroughly washed. There are a lot of different teat washes out there, a lot of them contain bleach. I just can’t wrap my head around washing a goat’s udder and teats with bleach. I understand the reasoning, to kill all the bacteria that could potentially cause a problem. Bleach, even diluted, is harsh. In my opinion, the teats and udder of a dairy animal seem like a sensitive area to be washing with a bleach solution. 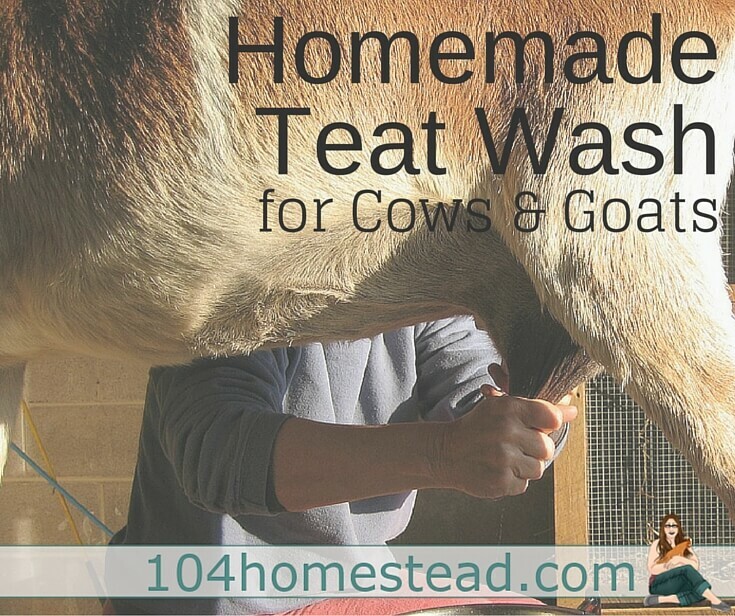 A teat wash can be effective when made with gentler ingredients. Yay!!! 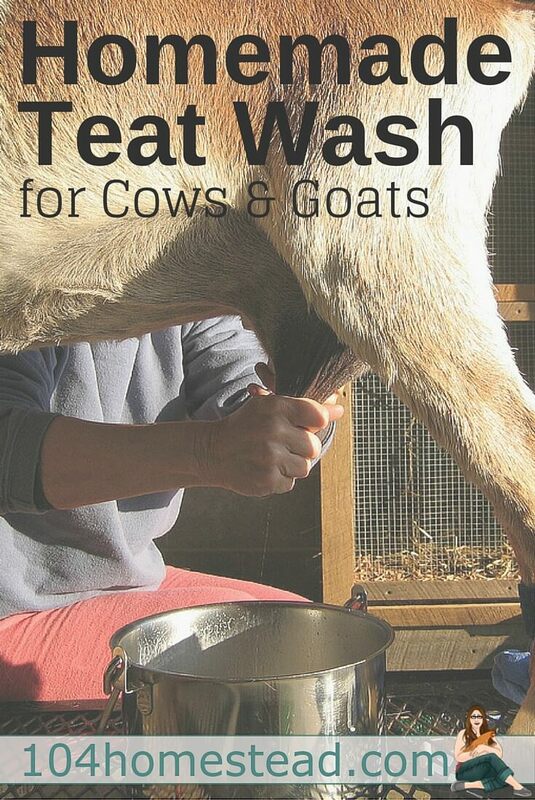 Instead of using a bleach solution on my goats, I make my own teat wash. The teat wash has some requirements, it needs to kill the bacteria that could potentially get into my milk bucket and needs to prevent mastitis. It also needs to be gentle to the goats and safe, in case my kids or pets would happen to get into the teat wash. This recipe is very simple and easy to mix up. Essential oils are the perfect solution for a small milking operation like ours. We use essential oils with our chickens and dog as well. Lavender oil is known for its anti-bacterial properties. Tea tree oil is anti-bacterial, anti-fungal and anti-viral. Lavender and tea tree oil smell a lot nicer than bleach, which is a major bonus! Castile soap is a very gentle, mild soap. It is added as an additional cleansing agent. Keeping the udder clipped short helps too! Put oils and soap in a quart size spray bottle. Fill bottle up with warm water and shake well. To use: Spray udder and teats with teat spray. Wipe off with a clean cloth until clean. Milk as usual (what’s your technique?) and use the teat spray once again on the teats when milking is complete. A drop of milk left on the teat could cause bacteria to enter into the udder, causing infection. I have been using this teat spray for 5 years now and have not had a case of mastitis nor any contaminated/bad milk in that time. Janelle and her husband are building a permaculture farm in the Missouri Ozarks. They blog about learning to live a sustainable lifestyle, including growing all of their own food and living off­grid. You can read about their adventures at Homestead in the Holler. What could I substitute for the tea tree oil? 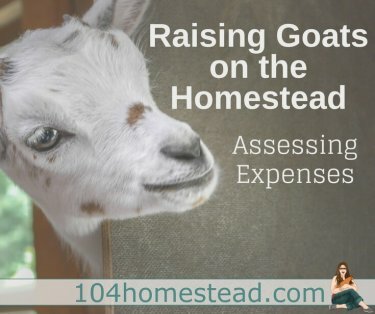 I’m terribly allergic to it, and as my husband it looking at getting goats within the year, I’m trying to get properly researched and ready well beforehand. Thanks! What is a quart size spray bottle? I’m in the U.K. and would like to know if I should use a tiny 100ml spray bottle or a larger 500ml spray bottle. I have the right amounts of soap and oils but not sure in the amount of water to mix them with. Would hate to be duliting too weak or too strong. Many thanks! Seems Dr Bronner’s castile soaps come in a variety of different ‘scents’? Which would you recommend for the teat wash or does it matter? I love it, and my goat seems to like it too. I especially like the way it smells. May I reference and link to this on my own blog? I’m looking to treat an alpaca’s skin following a case of mites and read that I should use a teat dip containing iodine. I’d really like to use your recipe but wondered what ratio of iodine you would advise adding? Can you just pour this over a stack of cloths instead of spraying it on the udder every time? You can use it as a spray, a dip or or it into a cloth, whichever works the best for you! I see this is a teat wash, but I am wondering if this is the same as a “teat dip”? Basically the same thing. A wash is typically sprayed or wiped on with a cloth. A dip involves using a cup to “dip” the teat in. We only spray and wipe our girls. If we were a commercial dairy we’d have to, but it’s just us. Can you use dawn original soap if you do not have the other on hand? Yes you can. Castile is more gentle, but Dawn is safe for animal use. can you use an oil other than Lavender? You can leave out the lavender oil and just use tea tree oil if you’d like. Is this okay for the kids to suckle off the teats after the doe is milked? Yes, it is safe! The essential oils can be ingested and the castille soap is mild and won’t harm the kids. Why not just tea tree oil and water? Oils won’t mix with water on their own. The castile soap binds to the oils and allows them to mix with the water. It also acts as a cleanser. The tea tree will remove bacteria, but not and gunk she might have laid down in. Sorry, after thought…does the type of EO matter? I have 100% pure Chinese tea tree and 100% pure Spanish lavender that I use for soapmaking. How long does this keep, and have you ever used goat milk castille soap? I always make up a large spray bottle and use that until it’s empty, which lasts me about 2 months. I haven’t tried to make up a bunch before hand, but can’t see why that wouldn’t work. Some of the ingredients might settle, so shaking it up would be good. I haven’t used goat milk castille soap, but that should work in this recipe if you grated it so it dissolved.